Ambuyat is considered the most popular delicacy in Brunei. It is made from sago and eaten by dipping a serving in a hot and thick sauce called cacah. 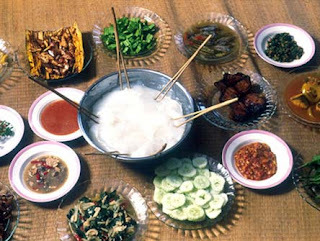 Ambuyat, in replacement of rice, is served with a minimum of three main and side dishes. Amok is a traditional Cambodian dish. 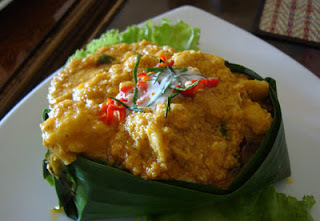 It’s fish mixed with curry sauce( kroeung) , coconut milk and steamed in a boat made origami fashion from a banana leaf. 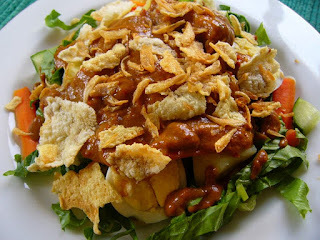 Gado-Gado is one of the well-known dishes from Indonesia. It is vegetable salad with peanut sauce. It is usually served with tomato wedges, bean sprouts, tofu, cabbage and boiled eggs. 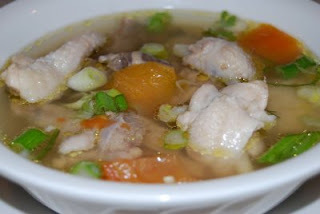 Chicken soup is a traditional Lao dish. Lemongrass, basil leaves, garlic and onions are important ingredients. Undoubtedly, Lao food is one of the greatest and healthiest cuisines with many types of fresh herbs. 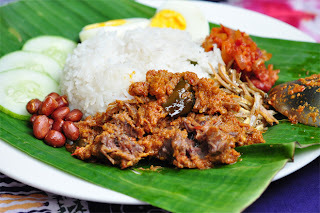 Nasi Lemak is one of the well-known dishes from Malaysia. It is Malaysian coconut milk rice with dried anchovies. Serve hot or cold with fried peanuts, crispy anchovies, cucumber slices, boiled eggs and sweet chilli paste. 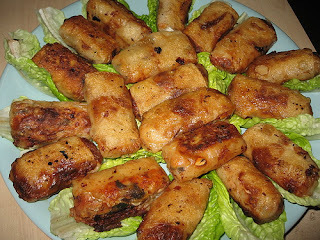 Nem is one of Vietnam’s favourite dishes. It is very easy to prepare. Ingredients used for Nem comprise of lean minced pork, sea crabs or unshelled shrimps, mushroom , dried onion, duck eggs, pepper, salt and different kinds of seasoning. All are mixed thoroughly before being wrapped with transparent rice paper into small rolls. These rolls are then fried in boiling oil. 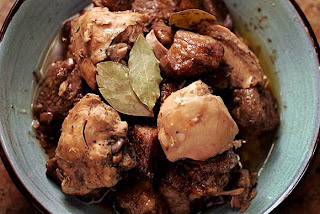 Adobo is the most popular Filipino dish.It can be made with either chicken or pork, but it is typically made with chicken. It is easily cooked by adding the pork and chicken to the pan. Then add 2 cups of water, 1/4 cup of soy sauce, vinegar, paprika and the bay leaves. After that bring to a boil and cover and simmer for 30 minutes or when meat is tender. It is typically served with steamed white rice. 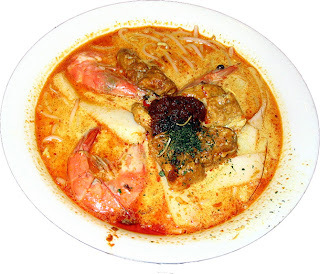 Laksa is spicy noodle that is popular in Singapore. It is a noodle dish in coconut milk and curry soup. Tom Yum Goong (Thai Spicy Soup with Prawns) is the name given to a very popular Thai soup that is hot, spicy and sour. It is made with prawns. It gives a delicious and unusual taste of being hot whilst slightly sour. The basic ingredients are lemongrass, galangal, kaffir lime leaves, fish sauce, red chillies, Thai chilli paste, lime juice, mushrooms and tomatoes. Lahpet is a national dish of Myanmar. 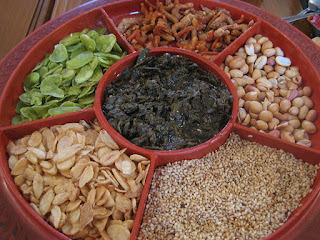 It is served traditionally in a shallow lacquer ware dish called lahpet ohk with a lid and divided into small compartments – pickled tea is laced with sesame oil in a central compartment surrounded, in their own compartments, by other ingredients namely crisp fried garlic, peas and peanuts, toasted sesame, crushed dried shrimp, preserved shredded ginger and fried shredded coconut.